Night Skiing. Monster Truck Jam. Sledding. That was the quick and dirty version. But since I have never been a woman of few words, let me elaborate. This weekend was a busy one; I might even say a tad bit exhausting. But it was good, oh so good. Friday night we all drove up to Snowbird for some night skiing. Liam's first time experiencing the slopes at night... He was just as reckless as always! The boy loves to ski, but he's all about speed. Trying to get him to make a wedge (or pizza) is a struggle. For now, we are fine with him just getting used to being on his skis for another year. But eventually he'll need to learn how to slow down. And stop on his own. Really just learn some control. He is as confident as ever and practically fearless. He also thinks that whenever he skis over a slight mound of snow that he is doing a jump. We don't crush his spirit. Liam put in 4 runs and a couple go's down the magic carpet by himself. I was impressed with how long he lasted. Both boys were asleep mere minutes after hitting their carseats. A successful night! Saturday was much anticipated... Finally, the day of Monster Truck Jam arrived! Yes, this is a super redneck activity. Yes, Conor & I may have been slightly embarrassed about buying tickets. But we knew Liam would absolutely love it! We also knew that it would be way too loud for Finn, so Conor was the lucky parent who got to attend. 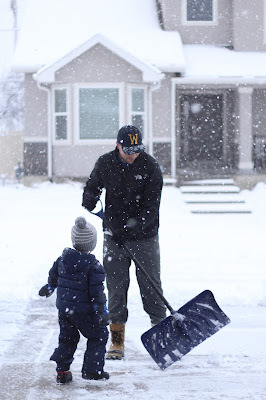 I took a long winter's nap with Finn, and was treated to a few pictures & videos of the fun. As soon as Liam walked in the door afterwards, he told me all about the jumps, and crushing cars, and doughnuts. He was one excited little boy who couldn't believe how big & loud the trucks were. Sunday we woke up to a good 4-5 inches of new snow. On mornings like these, it's straight into our snow gear and out to shovel. 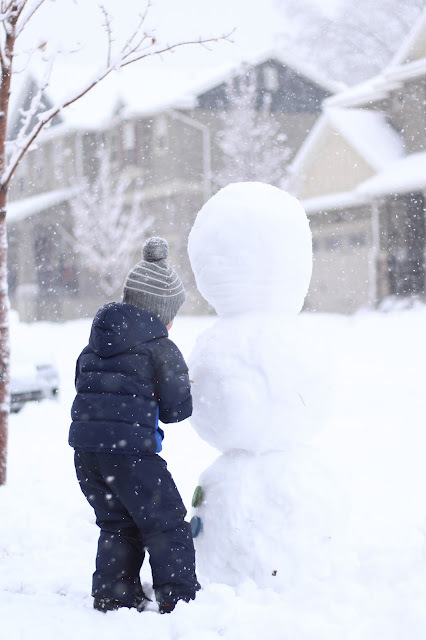 The snow was heavier & wetter than we typically get in Utah, so it was perfect for snowman making. Finally! This may just be my favorite way to start the day, followed by a cozy fire and snuggles. 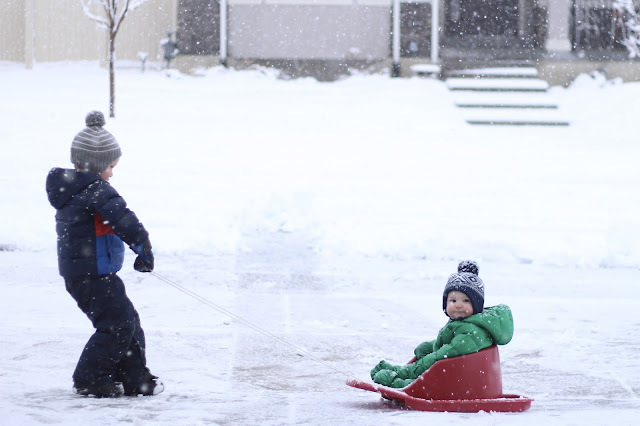 We couldn't keep Liam out of the snow, so that afternoon we went back to our favorite hill for some more sledding with the neighbors. Finn absolutely loves it too! And yes, we take him down the big one. He always has a huge smile on his face and a throws out a couple coos. And if we dare sled down without him, he kicks his little legs furiously making sure that the next sled down will be his! There may not have been much rest over the past couple of days, but memories were made! Now let's hope this next weekend comes along here real quickly; we're ready! So much fun!!! Love the pics! We finally got snow on Friday! 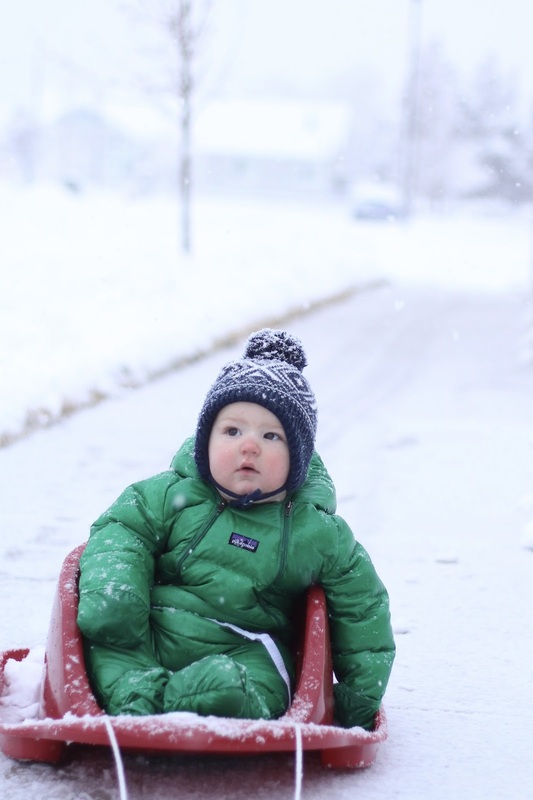 We took G sledding for the first time. It was so much fun. I'm glad you guys had such a great time. Aww, love seeing all these snowy pictures! Makes me wish we had a little snow to play in! The Monster Jam was here a couple of weeks ago and I really debated buying tickets. Maybe next year! I think we're going to see Frozen On Ice in May so we'll see how that goes! I'm sure I've said it before but I've never been skiing and it sounds so fun! So impressed at how awesome and brave Liam is! It sounds like you guys had so much fun! I love that Liam is already skiing! I'm missing that so much this winter, but hopefully next year we can get back out there! And loving the snow pictures as usual, you're amazing! My husband is taking our little guy to Monster Jam in February...they can't wait! :) But we are totally redneck, no denying that, lol. I love that your boys are such little snow babies...I guess they don't get much choice up there! Your snow pictures never disappoint! That snowsuit is adorable....do toddlers ever slow down?? I cannot let Arden see Liam's snowman...she would be so jealous! All of our snows have been pretty light and too dry. But Finn in the sled = cutest thing EVER. Looks like you guys had a great weekend! Monster Trucks sound totally up our alley! Sounds like a blast!! That picture of Liam pulling the sled is perfect! SNOW!! i love love love your snow pictures the most. and monster trucks?! that sounds awesome!! Oh, I love waking up to a good snowfall! It makes for a magical day...especially when you don't have any specific plans or commitments. :) Sounds like a great weekend! P.S. 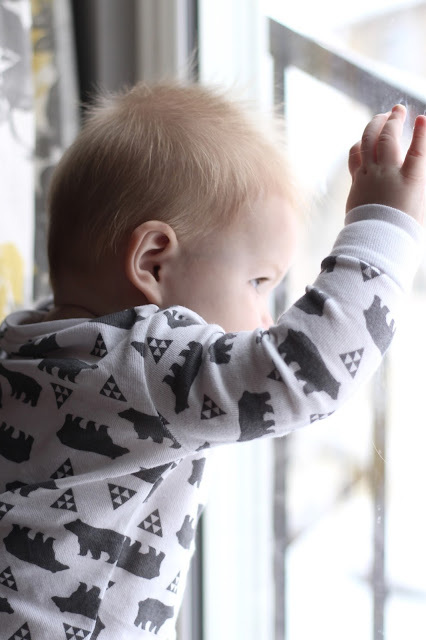 Just found your blog (and following along now)! Not sure how I got here but I'm happy I found ya and your delightful little space!